The family drama film Cake premiered in Pakistan yesterday and it was one delicious treat, I must say. 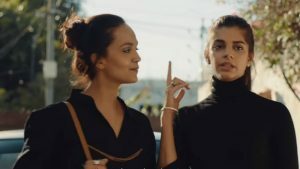 Starring Aamina Sheikh, Sanam Saeed and Adnan Malik in the lead roles, Cake is a film about a dysfunctional family that unites under grave circumstances. Directed by Asim Abbasi, the movie is multidimensional in its approach to bringing a rejuvenating experience to the viewers. It was really a dream come true to capture the long-dead essence of Pakistani cinema with this film. Cake was put together phenomenally; the acting was stellar especially of Aamina Sheikh who stood out. Her command on acting is brilliant and she manages to execute her roles brilliantly in almost every project. But her performance was one of a kind in this film alone. Sheikh amalgamated Zarine’s character really well and made it look believable on screen. Although the character has her occasional mood swings and outbursts but that is what makes her personality special. Without a doubt, Cake is what an ideal Pakistani film should be; less theatrics and thorough consistency in view of direction, visuals and acting. 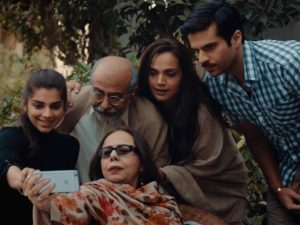 In my opinion, Cake is probably the first mainstream Pakistani film that has not compromised on content and quality unlike many haphazard movies created in the recent past. It has a fixed identity and a progressive storyline which are essential components in every film. It is mostly impulsive scriptwriting and poor direction that have done Pakistan’s cinema more harm than good. Perhaps filmmakers should take their time in making a movie to achieve an intense impact. 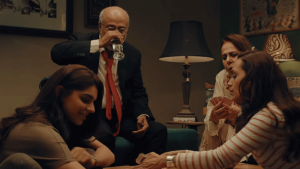 Director Asim Abbasi has created a masterpiece that almost every educated Pakistani can relate to but more importantly, reminisce in the long run; what corroborates the success of a film are memories that people take with them and Cake manages to achieve that feat. For those who do not know, Asim Abbasi is also the recipient of Best Director for Cake at the recent UK Asian Film Festival. The accolade is an evidence of hard work and commitment. What I would say to an average Pakistani is, book your seats and watch Cake while you can. It is perhaps the only Pakistani film I have come across that is not stereotypical. As far as the movie goes, I will not spoil the plot for the readers and moviegoers because I want them to experience the drive of the film, and enjoy it as they would a delicious, multi-layered cake! Most mainstream films are known for their box office earnings but movies that really matter are recognized for their content and brilliance. I commend the filmmaker and actors for investing in this film and making it a rare cinematic experience.